Last night I gave the final dose of oral Baytril (a type of antibiotic) and today we start TMS (a different antibiotic). MerryLegs has survived, against the odds, to enter what I hope is the final stage of treatment for internal pigeon fever. She will remain on TMS until her blood titers for pigeon fever (called a “SHI test”) are negative. This will likely take at least a couple of months. Yep, MerryLegs will be antibiotics for MONTHS. Remember me telling you we had a long road ahead of us? MerryLegs isn’t necessarily infectious right now, but the remaining internal abscesses are hard for antibiotics to reach. The body effectively walls off these little pockets of pus….but unfortunately that means that it also walls the antibiotics OUT. So, we keep her on an antibiotics until the final indication that the bacteria is gone – a negative titer. Alas, not all is certain even at this stage. Before graduating to this stage, the potential complication list was so long and varied, I didn’t even know where to start. However, we’ve finally gotten to the point where the list is short enough I can share with you some of the major complications that I am still worried about. The case mortality rate for internal pigeon fever is around 30-40%, however based on she was presenting on that Tuesday weeks ago, her odds of survival were quite a bit lower. Besides just good luck and intense intervention, another reason I’m looking at a very much alive horse right now is that the pigeon fever bacteria chose the lung (our best guess) instead of the liver or kidneys, which is a more common location. At the lowest point when she was showing signs of shock, rapid decompensation, and had a high fever, our best guess is that it was the result of an internal abscess(es) rupturing. Take a horse that doesn’t have a great appetite, seems like she’s hydrating OK but is showing signs of shock/poor organ perfusion, take them away from their buddies and normal pen and shove them in a stall…and then administer weeks of high dose NSAIDs. She’s been off of NSAIDs for a week, has a great appetite, and blood work for organ function was unremarkable. She was on gastrogard during the time I thought she was at highest risk, and I’m maintaining her on aloe juice now, so I’m less concerned. The nagging worry related to the NSAID use? Normal kidney values doesn’t mean we didn’t sustain damage. ~75% of kidney function has to go before seeing abnormal values. The downside of Baytril/enrofloxicin (the IV and then oral antibiotic that she was one the last 2 1/2 weeks) is that it causes cartilage defects in young growing animals. When we initially put her on it the vet and I had a conversation about the risks. After some research, even though MerryLegs is still technically growing and her growth-plates are open, the highest risk of cartilage damage the limits future athletic performance occurs when they are really young and really growing – weanlings and yearlings. Two year olds, even arab two year olds, are at a much reduced risk. Like the kidney damage, this is a long term risk that I may never know the consequences are. However, I’m comfortable with my decision and don’t anticipate it causing problems, based on the literature the vet and I researched. There are LOTS of other potentially career limiting factors that can happen to a horse between birth and five years old, and this is probably more minor. 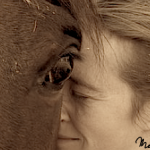 Founder, colic, colitis – things that really sick horses get, whether or not their primary problem has anything to do with their gut or metabolics. Founder was such a big worry when her fevers were so high for so long, I contemplated icing her feet with bags of frozen peas twice a day. I finally didn’t, deciding that it was more important to reduce stress, and figured that if she foundered then I probably wouldn’t have fully prevented it from happening with the icing, just perhaps reduced the severity. And founder of any severity probably would have been the final nail in the coffin for her. Now, with the fevers gone and the endotoxins greatly reduced/eliminated by controlling the internal abscesses with antibiotics, founder isn’t even on the list of things I’m worried about. Here’s what I’m still really concerned about. She was on antibiotics. She still is on antibiotics. She will be on antibiotics for a really long time. Colitis is a major risk for horses on antibiotics. Enrofloxicin is less likely to cause colitis and beyond some soft stools for the first couple of days, MerryLegs tolerated it really well. TMS is a relatively safe antibiotic, and is usually tolerated really well. But I can’t completely ignore this risk, and will have to be mindful of it for as long as she’s on antibiotics. At this point, she’s stable enough that perhaps we could pull her through a bout of colitis, unlike if it occurred in the first week or 2, so it’s not necessarily a death sentence…but wouldn’t it be nice if we didn’t have to go through another round of fLuis and stress, switching antibiotics again or worrying that we have to take her off antibiotics even though her titers are still positive? This is a now and forever risk. Similar to strangles or any other massive infection that horse successfully recovers from, there is an increased risk of developing purpura hemorrhagica in that horse’s lifetime. Again, at this point if she develops this complication, it isn’t an automatic death sentence for MerryLegs depending on how it develops. Purpura hemorrhagica is something I’ll have to be watchful of for the rest of MerryLeg’s life. It could develop in a couple of months, a couple or years, or decades from now as she’s enjoying a well-earned retirement. There’s no way of knowing. From the reading I’ve done, MerryLeg’s is less at risk for it than if she had strangles, which is good news. Purpura hemorrhagica is an autoimmune response that causes the blood vessels to be leaky causing “vasculitis”. Because it’s a disease of the blood vessels, and blood vessels are EVERYWHERE in the body, what the disease looks like in a particular horse depends on which blood vessels decide to be pissed off. It can be minor, or the horse can die. The skin could slough off. The kidney, muscles, or lungs could be affected. The horse could founder, colic, have neuro signs, or have weight loss. MerryLegs only had a single initial west nile vaccine before all this started. I live in an area where horses are diagnosed with West Nile and our temperate weather allows mosquitos to thrive year-round. She is not fully protected until she has her 2 dose initial series. I cannot finish vaccinating her until the pigeon fever is completely behind us, leaving her at risk for a long time, and through at least a couple of high risk seasons. There’s nothing to be done except cross my fingers. Same goes for all other vaccinations, which she is due for at the beginning of next year. I’m unsure of vaccines as a trigger in purpura development aside from the strangles vaccine in a horse at risk for the condition, so it’s something I’ll be talking with my colleagues and doing some literature reviews on the subject. Truly, horses the most fragile things designed and constructed by a pre-schooler. Let’s finish on happier news. MerryLegs seems to be doing just fine. Every time I go out to see her, her head is in the feedbunk with strands of hay adorning her forelock and mane. 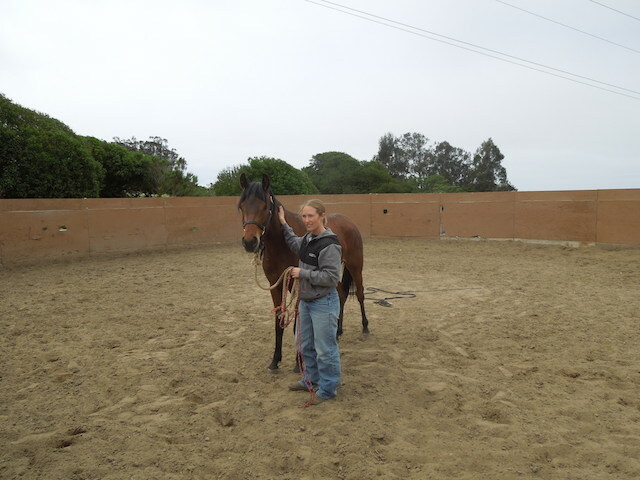 She remains an extremely good natured mare who seeks out humans for scratches and company. During turnout she runs like a race horse. She’s regained most of the weight lost during the worst of her illness, and is gradually putting on additional weight that she needed even before she got sick. Leaving her in a paddock, bored and unstimulated isn’t an option for the duration of the antibiotics. I’m going to try and avoid doing any real “work” with her, but it will be a fine balance between asking her to move as much as I need to get something accomplished (trimming her feet) without risking going over the threshold of “too much”. It will be a moving target and I’ll do the best I can, taking more risks for the things that *have* to be done (like trimming). I’m finally comfortable saying that it’s very likely in a year this whole thing will be behind us and before I know it, I’ll be swinging a leg over her back into a saddle and we will be hitting some trails together. Remembering the first time I met little miss MerryLegs! THANK HORSENESS!!! And a very good, caring, knowledgeable, and dedicated owner. Oh and she probably won’t randomly develop a coagulopathy and die either…. This was so wonderful to hear!! What a relief! This is so good to hear! Glad for you both.